What is Silhouette Soft® Thread Lift? Silhouette Soft® Thread Lift, sometimes referred as ‘one-stitch face lift’ or a ‘puppet face lift’, is a unique minimally invasive facial non-surgical cosmetic procedure used to re-contour the face by elevating the deeper layers of the skin. 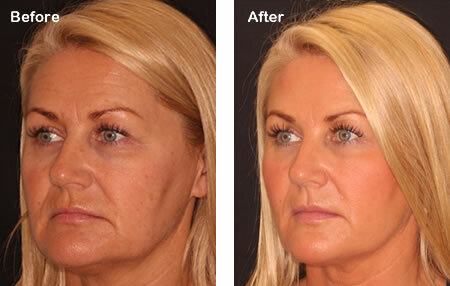 This results in a re-tightening effect for an immediate but discreet result. It also has a regenerative effect for gradual and natural-looking results. Who can have Silhouette Soft® ® Thread Lift? Silhouette Soft® ® can be used for facial reconstruction in the treatment of facial lipoatrophy or morphological asymmetry. The Silhouette Soft® Thread Lift is suitable for both men and women who suffer from mid face and cheek drooping, sagging jowls and creasing from the nose to the lips. Silhouette Soft is most beneficial for people in their mid- to late-30s to mid-50s, who have good skin support structure with only light sagging that does not require a surgical face lift. It can also be used for the elevation and the compression of the neck. How does Silhouette Soft® ® Thread Lift work? Silhouette Soft® ® is a resorbable sterile implantable single-use suspension suture made of Poly L-Lactic Acid monofilament with tiny blue molded cones along the length of the suture. The cones are made of Lactic Glycolide (a mixture of lactic and glycolic acids in a ratio of 82-18+. The cones are separated by knots. The cones are bi-directional and there are 4, 6 or 8 cones on each ‘side’ of the suture (from the centre), which are free-floating between the tied knots, at intervals of 0.5cm. Each set of cones faces in the opposite direction and points towards the end of the suture thread. Finally, two knots are position 1.5cms apart in the centre of the thread, at an equal distance from the mid-point, where no cones are situated. The suture acts as scaffolding under the surface of the skin to lift sagging soft tissues. The cones both hold the threads in place, and in time stimulates the body’s production of collagen to replace depleted facial volume which diminishes with age. How choose Silhouette Soft® ® Thread Lift? It is a minimally invasive non-surgical procedure. Silhouette Soft is a unique treatment which can be carried out on a variety of areas of the face with long lasting results. It can also be used in the neck. Treatment gives an Immediate lifting effect. Works by restoring body’s own lost collagen. Doctor will take your medical history and perform a facial/neck assessment. Use of prophylactic antibiotics: Oral Azithromycin 500 mg one hour before the procedure and for two days post treatment. Local anaesthetic is applied to the face and our specially trained doctor will insert the Silhouette Soft thread under the skin using a fine needle. After inserting the thread, the doctor applies slight pressure on the treated area to reshape the surface of the skin to achieve the immediate lift. Antibiotic cream will be applied at the sites of thread insertion. Ice packs may be applied to reduce the swelling and bruising. Clients are advised to refrain from chewing or drinking hot liquids until their face has regained full sensation. Clients are advised not to wash their face on the same day following the procedure. Gentle cleansing is permitted the next day. Avoid opening the mouth wide and avoid routine dental treatment for at least 4 weeks post treatment. Avoid taking aspirin for seven days after the treatment. Avoid extreme temperatures (sauna, etc.) for seven days after the treatment. Avoid having other cosmetic treatments for 14 days after the treatment. What are the side effects Silhouette Soft® Thread Lift? Swelling for two to three days following the procedure. Bruising associated with the threads is minimal but patients taking aspirin or other blood thinning medicine such as Plavix or vitamins such as vitamin C and vitamin E may be more susceptible to bruising. It usually takes two to three days for the swelling to go down. If bruising occurs, it can take up to one week to settle down. Results generally last for 12 to 18 months. We advise repeating the procedure after this time period. Can Silhouette Soft® Thread Lift be combined with other aesthetic procedures? It can be combined with other aesthetic procedures such as Botox, dermal fillers, Sculptra, Platelet Rich Plasma and fat transfer. When is Silhouette Soft® thread lift contraindicated? 3) Auto-immune diseases: scleroderma, sarcoidosis, amyloidosis, etc. 4) Anti-coagulant medication: coumarin & heparin. 8) Hepatitis B & C, HIV. 12) History of Herpes simplex labialis: give oral acyclovir prophylaxis.